When you need auto glass windshield replacement, home window pane, or door glass repair or commercial storefront emergency service, in Kearney, or surrounding Buffalo County count on Tri-County Glass, Inc.
Tri-County Glass, Inc. will come to your rescue to repair your glass window panes, damaged sliding doors, shower doors, mirrored glass and tabletop glass. 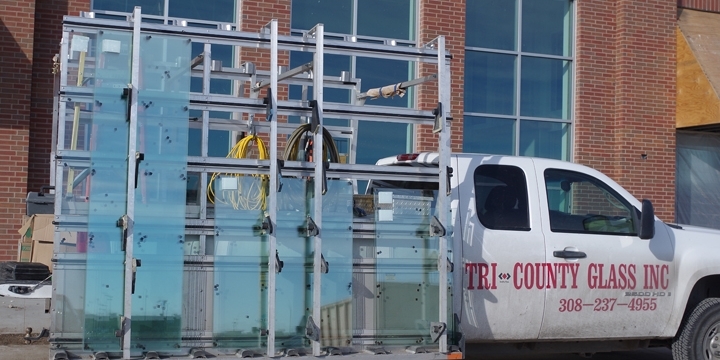 Tri-County Glass professionally certified glass service technicians promise to deliver superior service and value because Tri-County Glass strives to exceed your expectations. Tri-County Glass is conveniently located in Kearney, Nebraska and serves the surrounding communities in Buffalo, Kearney, Dawson, and Hall counties. If you need immediate glass repair or replacement help – whether it’s a cracked window, broken auto glass, or smashed storefront – call us toll-free at 308-237-4955 or send an online service request. If you are thinking about home interior upgrades, get inspired with our galleries of glass shower doors, decorative entry doors, replacement windows, and custom mirror.